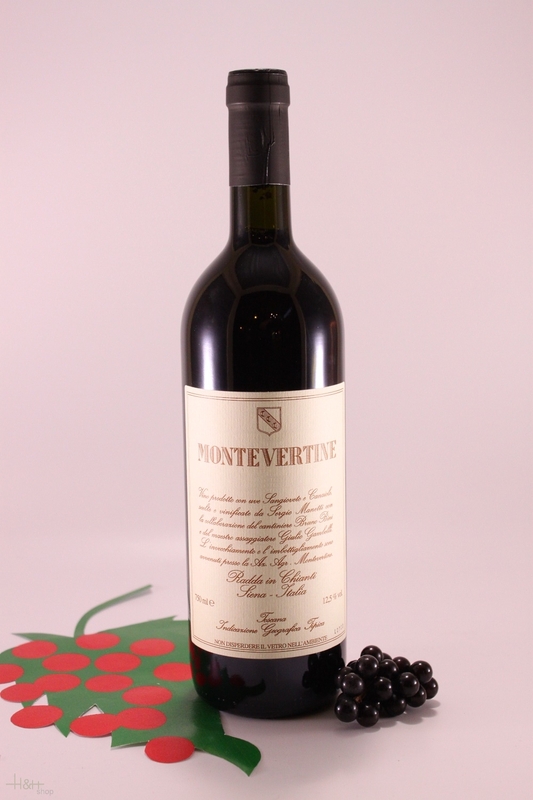 "Doctorwine" has rated the wine "Montevertine Toscana IGT, Tuscany, Italy" from the vintage 2007 on 29.12.2011 with 88 of 100 points.
" From Sangiovese grapes. A ruby color with hints of garnet, it is extremely limpid. The bouquet opens with the classic scents of black cherries, violets, tobacco and almost animal-like accents which vanish after a few swooshes in the glass. The taste in dominated by a very fresh tartness, which tends to balance the flavor and fully compensates its glyceric/alcoholic softness. The tannins are only slightly noticeable and only at the beginning. The aftertaste is delicious, where it recovers if softness and warmth. " "Falstaff Magazin" has rated the wine "Montevertine Toscana IGT, Tuscany, Italy" from the vintage 2013 on 10.02.2017 with 92 of 100 points. "Vinous Antonio Galloni" has rated the wine "Montevertine Toscana IGT, Tuscany, Italy" from the vintage 2013 on 01.09.2015 with 92 - 94 of 100 points. "Vinous Antonio Galloni" has rated the wine "Montevertine Toscana IGT, Tuscany, Italy" from the vintage 2009 on 01.12.2013 with 94 of 100 points. "Vinous Antonio Galloni" has rated the wine "Montevertine Toscana IGT, Tuscany, Italy" from the vintage 2010 on 01.08.2013 with 92 of 100 points. "Wine Spectator" has rated the wine "Montevertine Toscana IGT, Tuscany, Italy" from the vintage 2008 on 15.10.2011 with 92 of 100 points. "Vinous Antonio Galloni" has rated the wine "Montevertine Toscana IGT, Tuscany, Italy" from the vintage 2008 on 01.08.2011 with 92 of 100 points. "Wine Spectator" has rated the wine "Montevertine Toscana IGT, Tuscany, Italy" from the vintage 2007 on 31.10.2010 with 92 of 100 points. "Vinous Antonio Galloni" has rated the wine "Montevertine Toscana IGT, Tuscany, Italy" from the vintage 2007 on 01.10.2010 with 93 of 100 points. "Wine Spectator" has rated the wine "Montevertine Toscana IGT, Tuscany, Italy" from the vintage 2006 on 31.10.2009 with 90 of 100 points. "Luca Gardini" has rated the wine "Montevertine Toscana IGT, Tuscany, Italy" from the vintage 2005 on 04.07.2008 with 89 of 100 points. "Wine Spectator" has rated the wine "Montevertine Toscana IGT, Tuscany, Italy" from the vintage 2004 on 31.10.2007 with 89 of 100 points. "Wine Spectator" has rated the wine "Montevertine Toscana IGT, Tuscany, Italy" from the vintage 2001 on 31.10.2004 with 86 of 100 points. "Wine Spectator" has rated the wine "Montevertine Toscana IGT, Tuscany, Italy" from the vintage 2000 on 15.10.2003 with 85 of 100 points. "Wine Spectator" has rated the wine "Montevertine Toscana IGT, Tuscany, Italy" from the vintage 1999 on 15.10.2002 with 88 of 100 points. "Wine Spectator" has rated the wine "Montevertine Toscana IGT, Tuscany, Italy" from the vintage 1998 on 31.10.2001 with 88 of 100 points. "El Mundo Vino" has rated the wine "Montevertine Toscana IGT, Tuscany, Italy" from the vintage 1997 on 15.11.2000 with 16 of 20 points. "Wine Spectator" has rated the wine "Montevertine Toscana IGT, Tuscany, Italy" from the vintage 1997 on 31.07.2000 with 90 of 100 points. "Wine Spectator" has rated the wine "Montevertine Toscana IGT, Tuscany, Italy" from the vintage 1996 on 30.11.1999 with 87 of 100 points. "Wine Spectator" has rated the wine "Montevertine Toscana IGT, Tuscany, Italy" from the vintage 1991 on 30.11.1999 with 84 of 100 points. "Wine Spectator" has rated the wine "Montevertine Toscana IGT, Tuscany, Italy" from the vintage 1995 on 15.12.1998 with 88 of 100 points. "Wine Spectator" has rated the wine "Montevertine Toscana IGT, Tuscany, Italy" from the vintage 1994 on 30.09.1997 with 84 of 100 points. "Wine Spectator" has rated the wine "Montevertine Toscana IGT, Tuscany, Italy" from the vintage 1993 on 31.10.1996 with 88 of 100 points. "Stephen Tanzer" has rated the wine "Montevertine Toscana IGT, Tuscany, Italy" from the vintage 2007 with 93 of 100 points.